Abstract: Establishing optimal aesthetics, function and periodontal health in patients with missing teeth is a complex and challenging process, which demands the interaction of several dental specialties for effective multidisciplinary management. The most frequent scenario encountered within the orthodontic-restorative interface is missing teeth; this article focuses on the management of missing teeth, discussing diagnosis, the treatment planning process, treatment outcome and retention. This is demonstrated throughout a series of clinical cases treated within a multidisciplinary team. Clinical relevance: The management of patients with missing teeth is often challenging; with a variety of orthodontic and restorative treatment options for the general practitioner. Author notes: Sara Hosni, BDS, DDSc (Orth), MFDS RCS(Ed), MOrth RCS(Ed), Specialty Dentist in Orthodontics, Salford Royal NHS Foundation Trust, Stott Lane, Manchester, M6 8HD, James Darcey, BDS, MSc, MDPH, MFGDP(RCS Eng), MEndo RCS(Ed), FDS Rest Dent RCS(Ed), Consultant in Restorative Dentistry, University of Manchester Dental Hospital, Higher Cambridge Street, Manchester, M15 6HF and Ovais H Malik, BDS, MSc(Orth), MFDS RCS(Ed), MOrth RCS(Eng), MOrth RCS(Ed), FDS(Orth) RCS(Eng), Consultant in Orthodontics, University of Manchester Dental Hospital, Salford Royal NHS Foundation Trust and Northenden House Orthodontics. 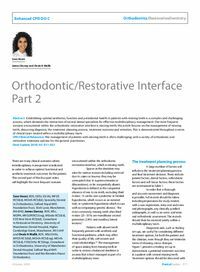 Objective: To demonstrate the importance of multidisciplinary management within the orthodontic-restorative interface and understand the clinical implications of space closure and space opening.